I finished my Christmas quilt with 3 weeks to spare… before it goes into a tub in the basement for another year!!! This short season business is lame-o. I backed it in a green and white polka dot flannel. As you can see I did a good ol’ stipple all over….it’s been awhile since I stippled a quilt and it was a nice relaxing change! Pattern is Bizzy Kid (made a bit scrappy) and fabric is a mix from my stash. I might need to keep this one out a little longer…red, green, and aqua works for Valentines Day right? And speaking of Valentines Day….I really really love this girl. And candy canes. Especially the mini ones. Keep it out the whole year… It is gorgeous! Love it….subtle enough to keep out year round! Oh yeah! The quilt is so pretty – definitely works for Valentine Day too! Your quilting is perfect – Congratulations on the finish! My goodness how she has grown! She looks just like you. Wow time flies..Love the quilt of course. You are my quilt idol! She is beautiful and I love the quilt. Did you prewash the flannel? She's pretty cute…and lovely quilt too! L.o.v.e. your quilt! I have your pattern and need to get busy!:). Your little one is growing so fast – she's absolutely adorable! Happy Holidays!! I love it! And yes it can totally work for Valentine's Day. And it has green in it so I vote that you leave it out at least until St. Patrick's Day! When you back a quilt in flannel do you wash the flannel first? I'm thinking of backing one in flannel-Jo-Ann has a good deal on it right now! But I've heard that flannel shrinks at a different rate than plain ole cotton. 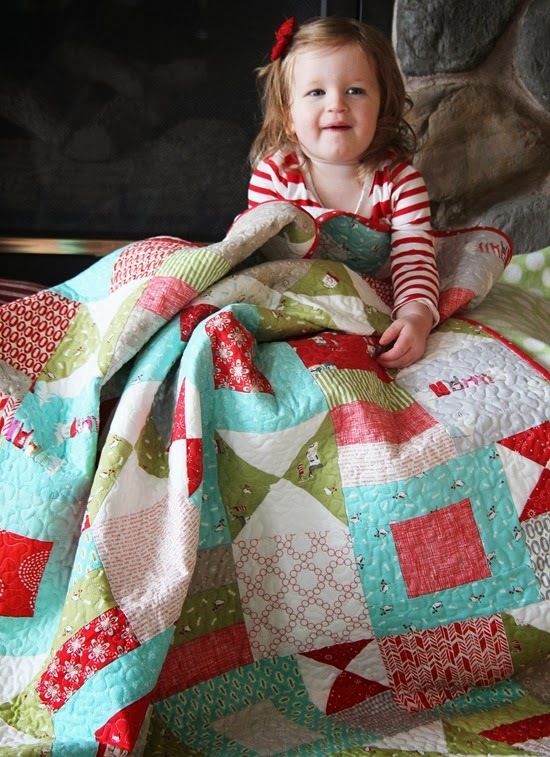 Love your quilt and your little one is so cute! So glad you share your creativity with us – it is soooo helpful to see what you are doing! Inspiring too. I like that this quilt is scrappy and a good way to mix up fabrics. Thank you and Happy Holidays! I would keep out that quilt all winter!! I don't think it needs to be packed away right after xmas at all. Merry Christmas! also, are you doing any demos or teaching in our area? Just curious! Love your style an use of color, have a Merry Christmas! That is as pretty as your little girl!! I received my pattern of the same and I thank you very much. I agree you should leave it out till Valentines Day!! For those that asked…I do pre-wash my flannel, just to make sure it's not going to shrink to much after it's quilted! Thanks! Love seeing this finished. I made this immediately after I saw your first pic. It's pieced waiting for backing and quilting. Love this. I would let my little girl use this year round. Sweet quilt, Allison! Sweeter wee redhead. ;) She grew wayyyy too fast. Oh my…it seems like yesterday when she was posed as a teeny tiny thing on one of your quilts. I think this is a year round quilt! It is a beautiful finish. 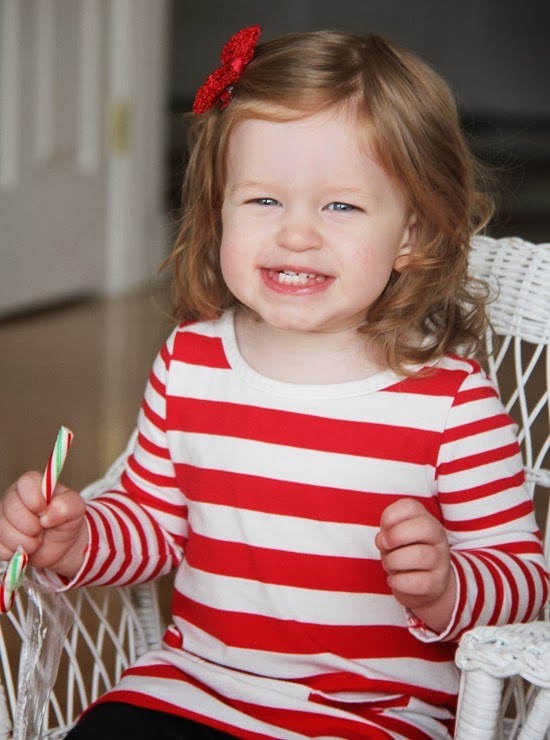 Your little candy cane is so precious. You know that quilt deserves to see a bit more winter! How snuggly it looks! Here at my home, we spread the happy season of Christmas out past the holiday too. I love working on Christmas felt ornaments and sitting around (when I'm not at work) just spending time with my kids. As my kids are getting older (Beckett is 11 now) I have to try to find (sneaky) ways to spend time with each of them. ha! Still just lovin your blog, and your quilts. And your family…you are so blessed! The quilt is lovely and all the perfect colors – yep, I'd keep it out until March 1, personally. And this little munchkin – well, she is growing into the most beautiful child. It has been a privilege to watch her come along – know she is "mama's girl" and so happy with quilts! I love how the quilt and your little girl match. It made for the perfect little picture opportunity. Sure keep it out a did bit longer. No one will notice :) Happy Holidays! Beautiful! I love this quilt!!!!! Beautiful quilt and darling little girl! 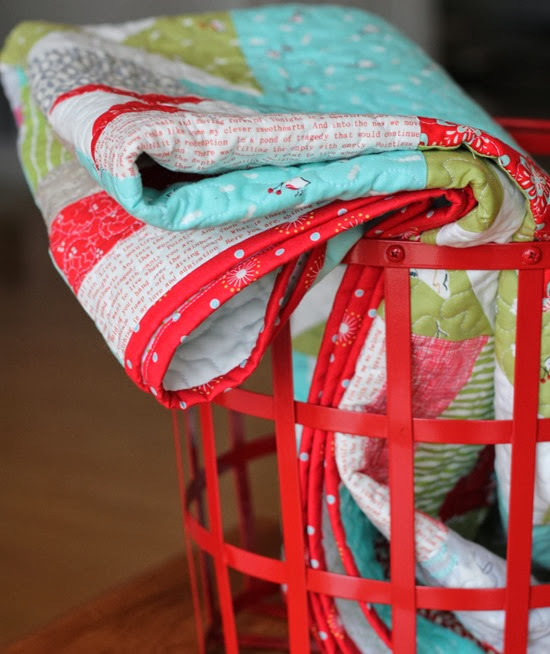 Did you use a long arm machine for the quilting? That girl steals my heart every single time! She is so very lovely. I can't believe how fast she is growing up. Bizzy Kid has always been my favorite of your patterns and seeing it in holiday fabrics is such a treat! I hope you and your family have a wonderful Christmas. 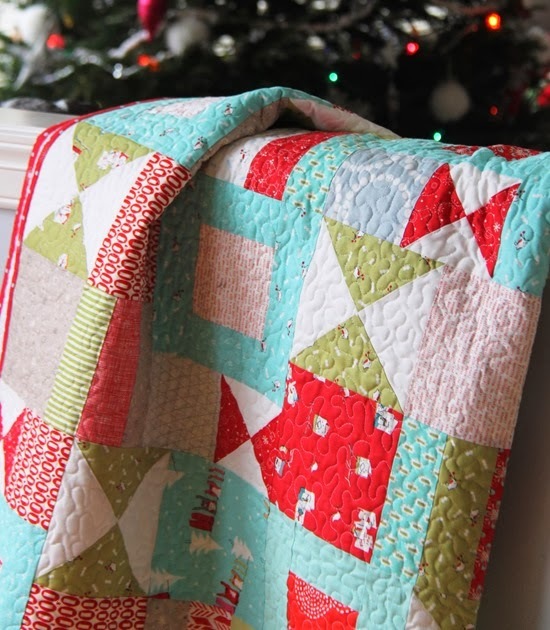 YES you can use this longer than the Christmas season…it's a winter quilt! Sweet fabric and cute pattern. I'm not usually a 'comment person' but wanted to say I enjoy your blog, your patterns and the inspiration you provide. Thank you and Merry Christmas! Is that red metal bucket from Target? I am stalking it to see if it goes on sale. That is a great year-round find, don't you think? I love the quilt, but your baby is just so adorable! and getting so big! !